TEXAS, US / ACCESSWIRE / October 31, 2018 /Distributed Ledger Technology (DLT) is changing the approach to solving problems. Right now, you will find many startups trying to solve problems in a completely different way. IoT, for example, can see vast improvements due to the blockchain, distributed ledger technology, and the decentralized features implemented in a service. Right now, IoT and cybersecurity are one of the hot topics out there. IoT security is a big concern and researchers are working hard towards a solution that can help solve IoT security issues. According to HP, IoT devices are all vulnerable to attacks. The vulnerabilities don't end with IoT devices as anything connected to IoT devices are also prone to be hacked. The following are the main IoT security issues right now. Meet NOVAM, a distributed cybersecurity company focused on IoT. It is a distributed ledger startup that aims to solve IoT security problems with the help of DLT. They are using Distributed Ledger Technology (DLT) Architecture which is not a traditional blockchain architecture. By using DLT, they are aiming to provide better security, scalability, and interoperability to the enterprise systems. NOVAM aims to protect IoT devices using Distributed Ledger Technology. They are using a cybersecurity approach which is autonomous, self-detecting and agnostic. 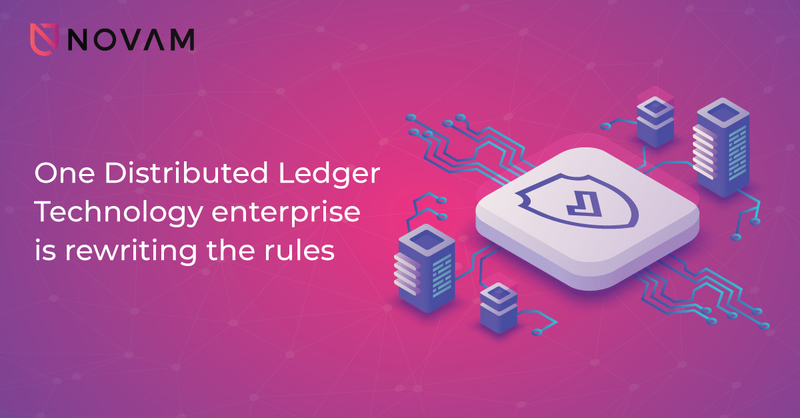 By doing so, they are protecting the connected IoT and improving its security, connectivity, and scalability. They started working on the project when their founders realized that they could make use of the DLT, IoT, cybersecurity, and AI. Their work began as early as 2016. How NOVAM solves the problem? NOVAM is inspired by none other than the human immune system. It works like a monitoring system where IoT devices are kept safe from any cybersecurity threats. The threats are mitigated to protect the network. It also works simultaneously to generate investigation material related to auditing and compliance. These forensic investigations can be used by an enterprise to improve their systems further and report pertinent information to stakeholders and governments. This intelligent behavior is achieved by using techniques such as probabilistic mathematics, machine learning, and other advanced methods. NOVAM constantly learns about the network and uses the new information to protect the network in case of an attack. It acts as an immune system, improving itself and even automatically replacing, removing, or quarantine threats. NOVAM provides endpoint protection, network protection, audit and regulatory compliance, and device & system mitigation. To get a better understanding of what they have to offer, let's have a look at some of the use-cases. 1. Health Check: NOVAM can work in real-time to check the health of the devices and ensure that they are not compromised or modified by 3rd party actors such as malware. 2. Distributed Ledger Technology(DLT): Another use case of NOVAM is the ability to manage a network. It can be used to authenticate trust within the network, mitigate threats when needed and also collect data for auditing and regulatory compliance. 3. IoT Device Visibility: NOVAM can also be effectively used for IoT device visibility into an enterprise IoT ecosystem. It gives enterprise both flexibility and visibility on their network, enabling them with the ability to monitor their IoT devices securely. With IoT becoming more prevalent in 2018 and beyond, it is now a perfect time for startups to work towards solutions that benefit enterprise and consumers alike. NOVAM is one of those companies that are pulling ahead of the curve and solving critical security problems with their approach. They are utilizing all the latest technology to ensure that the future of IoT stays intact. So, what do you think about sentient cybersecurity solutions? Comment below and let us know.